Another 24 hours of model runs to look over…so much fun. Looks like the weather is still going to get colder next week. I will be on vacation and away from my computer a good chunk of the time from midday Wednesday to Saturday night. If you are a new commenter on this blog, your comment may get approved in less than 24 hours. And possibly no new updates on this blog until that time. If the action starts to look REALLY good again early next week in the models, then I’ll post from a hotel room I suppose. I’ll be out-of-town part of that time. KEEP IN MIND THIS POSTING WAS ON TUESDAY. Rain/snow showers possible Monday before we dry out. Details are still very uncertain with respect to getting snow down below the foothills. We may just see a dusting on the hills Monday and then we dry out. 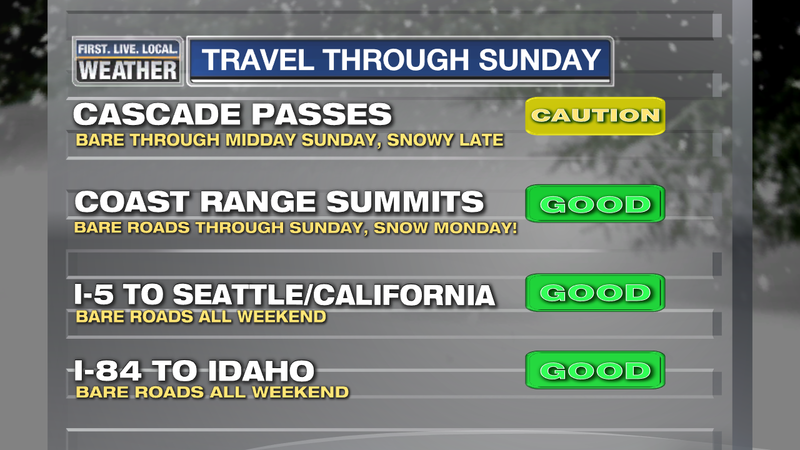 Travel looks excellent across the region through Sunday, snow levels will stay high in the mountains through Sunday afternoon, so passes may remain clear through that time. What has changed in models/maps/my thinking the past 24 hours? 2. GFS speeded up the timing quite a bit last night and this morning, but has now slowed down to show almost exactly what the ECMWF shows. Offshore flow, a cold air mass, and a very wet low sliding by just to our south…nice. So, right now I see a slight chance for snow for some of us if everything were to turn out just perfect early next week, then a cold spell the rest of the week. Just not a huge arctic blast, and likely no big snowstorm either. That said, when you have a huge upper-level ridge to the west and northerly flow, something could easily spin up in the models the next few days and put a snowstorm into our forecast…stay tuned. 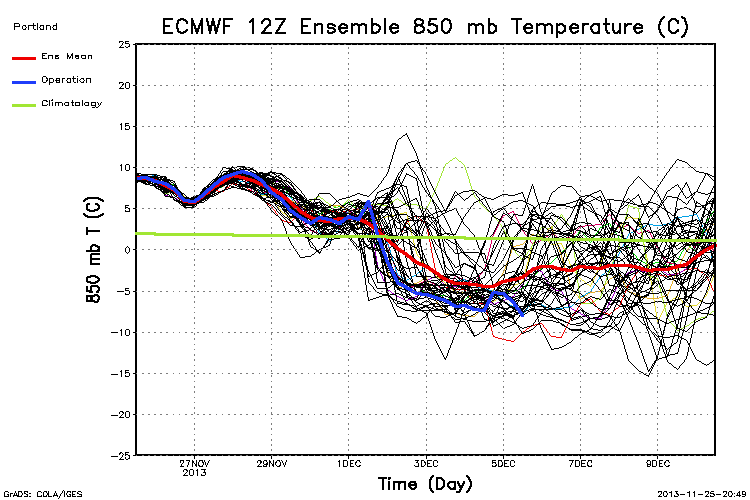 Ensemble average was a little lower than the operational run Tuesday/Wednesday, more like -10. 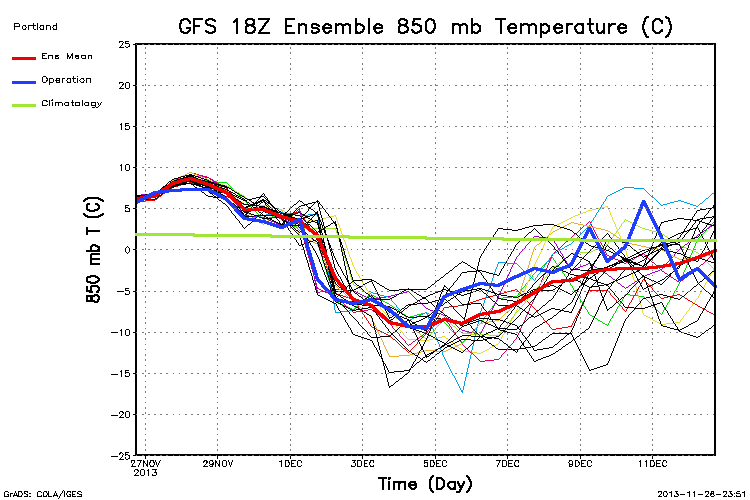 Notice NO warm members (warmer than -5) during that period. A real quick post, only because of one chart I just looked at. I’ll do a real posting for regular people who don’t need all the technical geekery) later this afternoon. 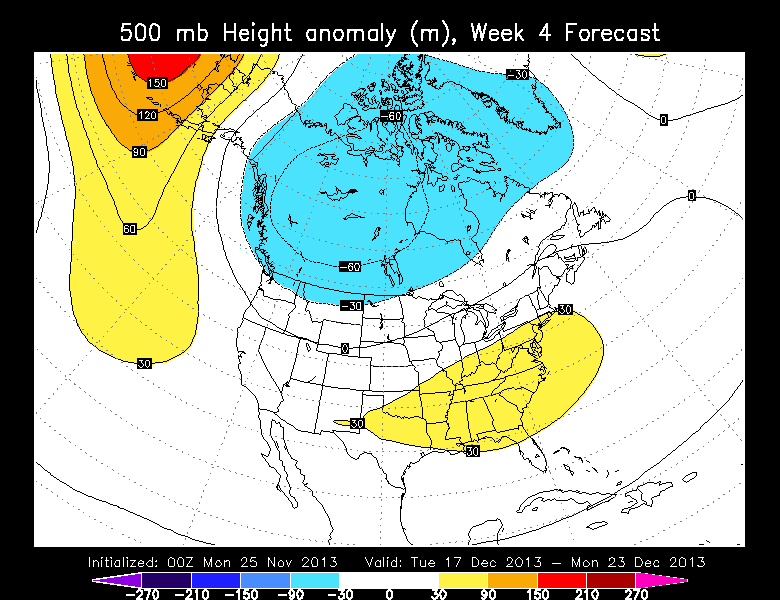 Approaching cold pattern is definitely still ON. Based on this chart, the faster movement might not be correct. But based on this chart, all ensemble members are down around -7 by Monday evening anyway, regardless how each run “got there”. The drier arctic front is still timed for Monday night, not as well defined this time. 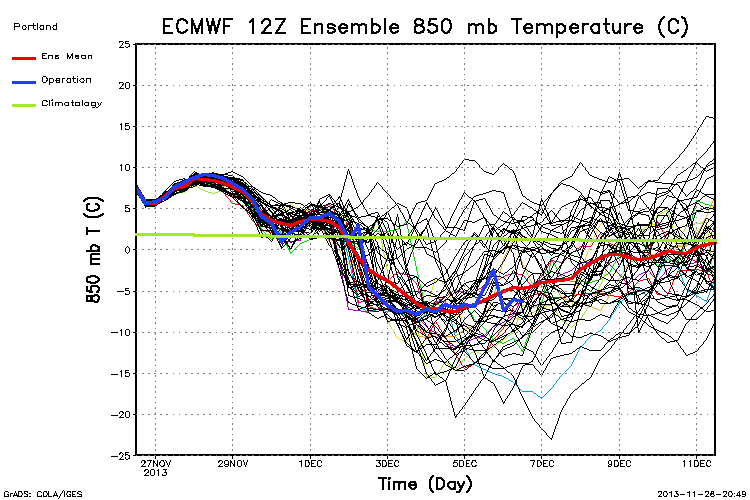 12z operational, which wasn’t nearly as cold as ECMWF or earlier runs, is one of the warmest members by Tuesday. So it’s quite possible the next run of the GFS will be colder again. A lot of the “noise” has disappeared from Monday and Tuesday, very few warm members now. 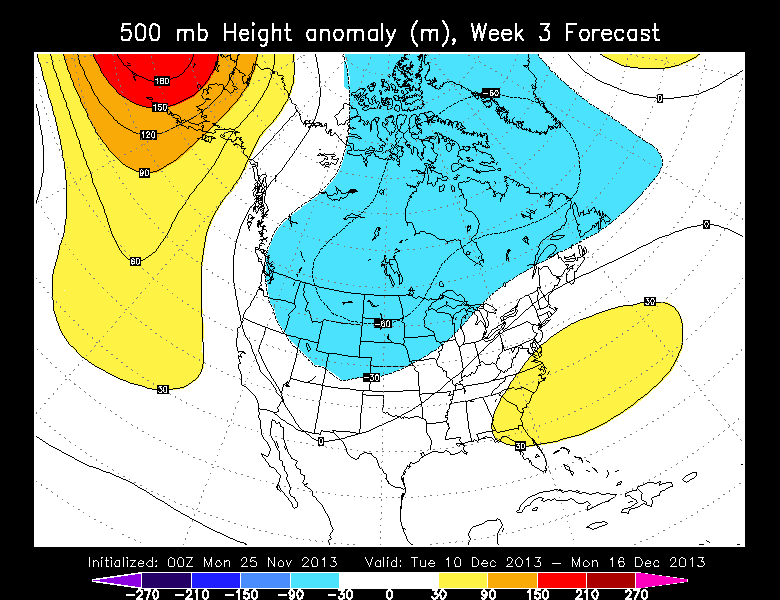 Something chilly is going to happen early-mid next week. 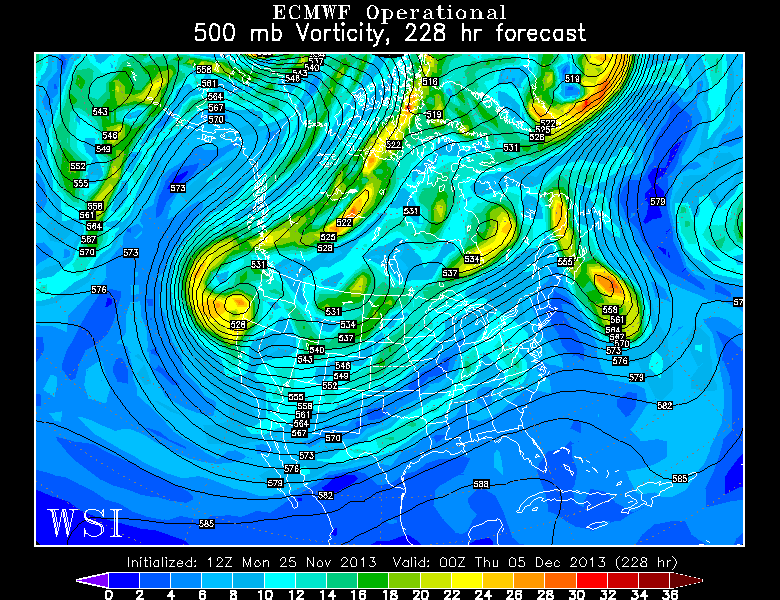 As always, I’ll be looking forward to the ECMWF during the next hour. It just comes out twice a day, which is probably good. Not as many “mood swings” with either the model or me. Very Intriguing (Cold?) Weather Pattern Ahead! This weekend was just about the best November weekend I can remember. For a gardener it was incredible, totally dry (drier than any spring day) vegetation so I cleaned up big-time. Plus I put up my Christmas lights now instead of waiting for yucky and cold wet weather. No one can see my lights, so I turned them on; otherwise that would be socially unacceptable! The weather stays real quiet through at least Friday, maybe a bit beyond. As a result, no Thanksgiving travel issues anywhere in the Pacific Northwest…probably through Sunday. November will end much drier than normal. Lucky for the ski areas, the bright blue skies allow the snowpack to stay consolidated even with 50 degree temps the past two days. Meadows had a preview weekend and Timberline is just barely operating. Skibowl will be opening their tubing hill this coming weekend since they’ve been making snow. 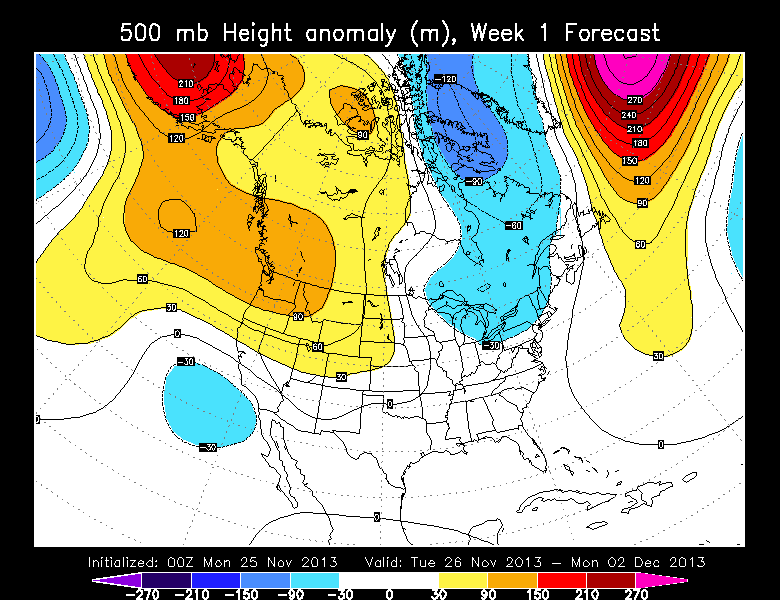 Models are advertising a big change to our weather pattern about next Monday or just beyond. This is just beyond our 7 Day forecast, thus little or no reference on TV…for now. But that’s what social media (like this blog) is for. 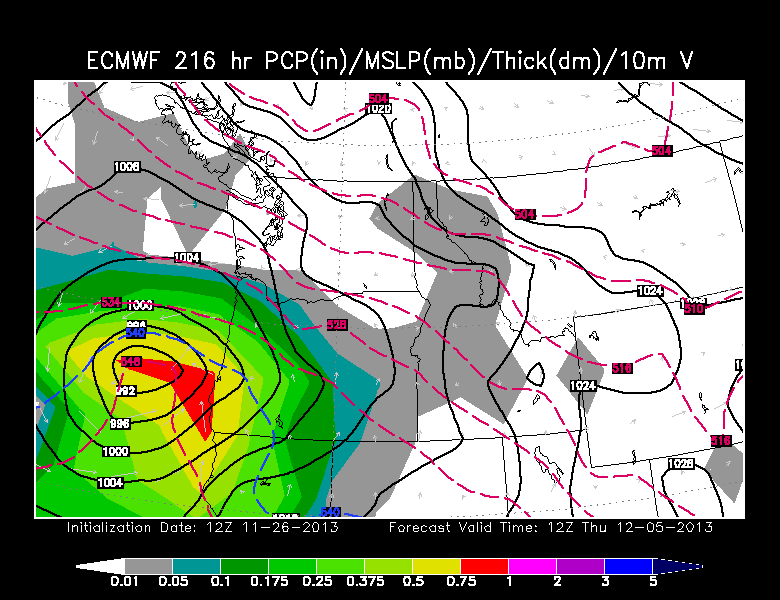 Pretty decent agreement…look at the actual map from the ECMWF for Wednesday afternoon! Remember this is 9 DAYS FROM NOW. 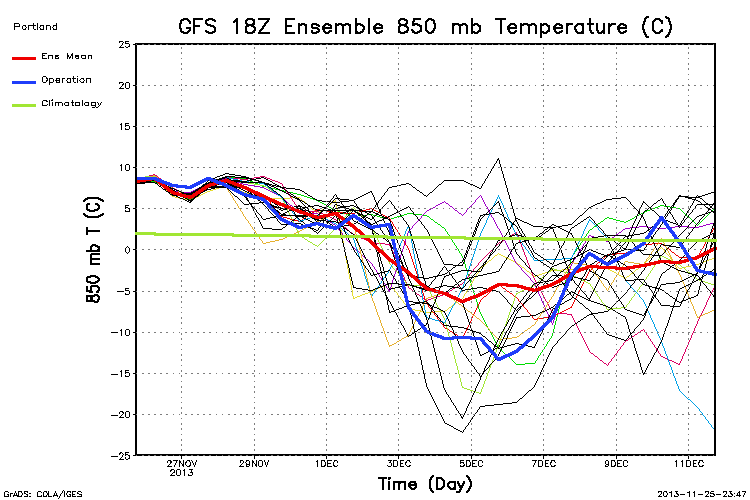 That’s definitely big cold spell material, and the GFS is similar. Of course the devil will be in the details. 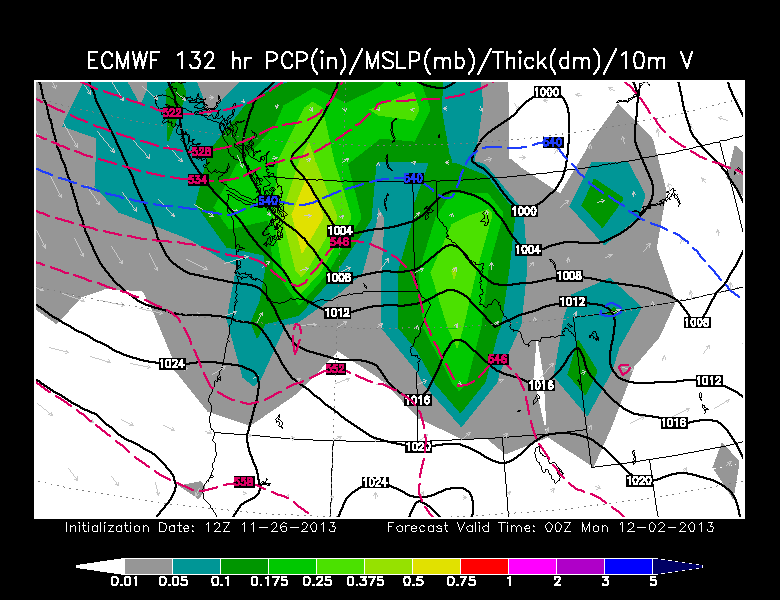 The ECMWF has us cold enough for snow down to 1,000′ or a little below Monday, then just cold and dry. It also had a 2nd system moving down the coast for a possible dose of snow (what you see here) later Wednesday and Thursday with a very cold/strong Gorge wind. Due to it’s better performance in general, I’m giving it more weight than other models the next few days. Note large variations in the ensembles after Saturday. Extremely chaotic. As a result, we could skate through this with a marginal snow shower setup, or have the best arctic blast since 1998…who knows right now. 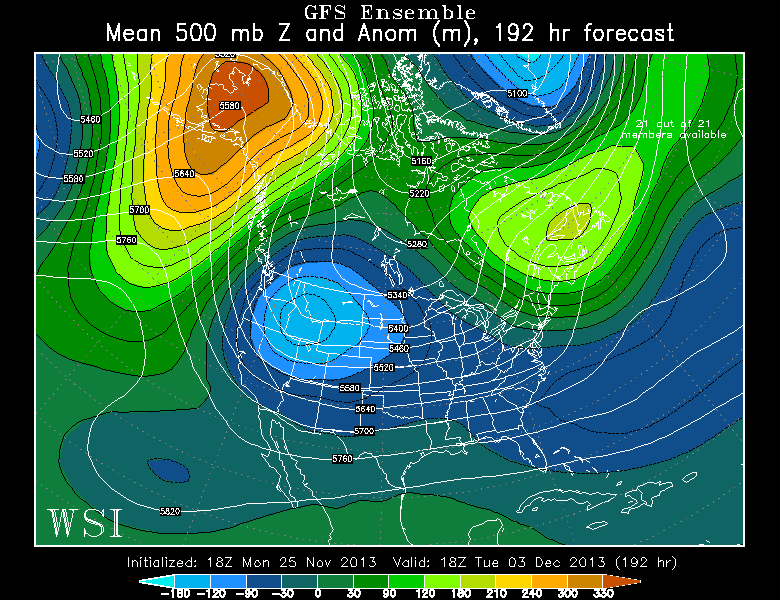 OR, in the next two days the ridging could decide to develop closer to us again. Remember that two weeks ago it only took about 3 days for models to go from “coldest weekend so far” to slightly warmer than average in the end. 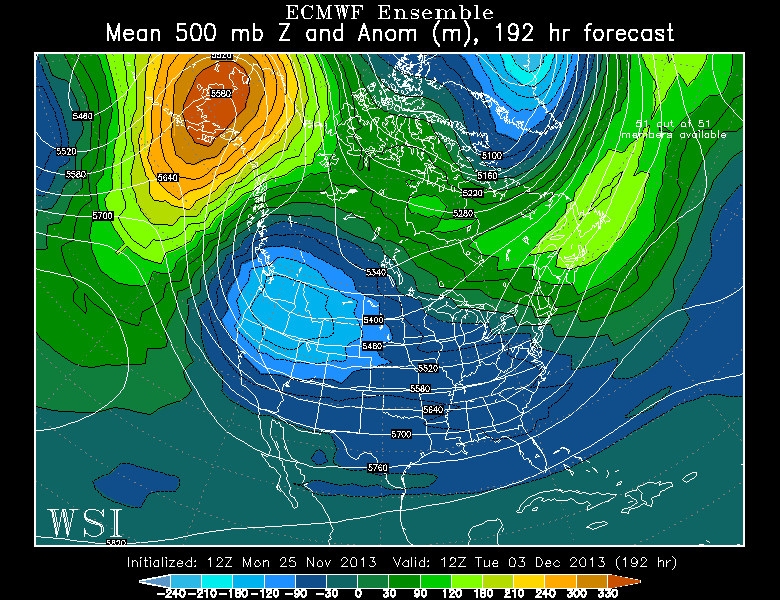 I can almost guarantee models will be all over the place for another day or two. That, plus the fact that it’s just beyond our 7 day forecast anyway, means I won’t be making a big deal out of this on-air…yet. There has been some serious meteorological eye-candy though the past two days! And there will be more to come…enjoy. I’ll post again in a few minutes. 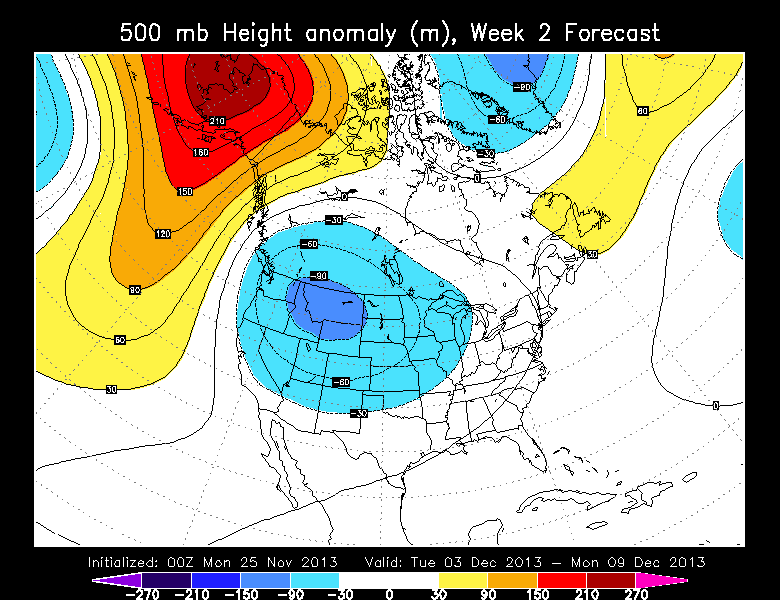 Here are the 4 weekly ECMWF upper level height anomaly maps from last night. Pretty consistent theme! Then one day the boss asked me something like “how much of this month’s paycheck do you really need?”. Wow. Not a good sign. Things went downhill after that and the company fell apart. Lucky for me, at the same time both Heidi Sonnen and Bob Shaw (morning and weekend weather) were leaving KOIN-TV; thus KOIN was desperate. I remember coming in for an interview, and Randy Querin who had been working 6-7 day weeks said “I don’t care if we hire a monkey, I’m tired of this”. Apparently I was just barely good enough; I had a real TV job! I don’t have video of my very first day, but Ken Boddie just before the first hit said “don’t worry dude, there are only about 70,000 people watching” , then laughed. Wasn’t funny at that time. The first KOIN video was about 2 weeks into the job and the first time I was on a big weekday show…scary. That’s Marcia Coffey and Mark Hendricks. By the way, working weekends for about 4 years with Ken Boddie was the best, he showed me what I should and should NOT wear. I was a small town kid with no fashion sense. And, Saturday nights the weather center had the only real nice TV for watching Star Trek The Next Generation…good times. The following two clips are about 6 months into the first job and then almost 2 years after I started. Check out those ties? Who allowed me to wear those? The last one was in the summer when I used to windsurf a lot. Looks like I had a lot of sun and the hair was getting a bit brighter. Then in the summer of 2002, KPDX’s corporation (Meredith) bought/swapped KPTV for another station in Orlando, so both stations are now owned by Meredith. Lots of layoffs that time too, but somehow I survived. Rod Hill and I were briefly co-chief meteorologists for about 9 months before he left to take a job at KATU when Rob Marciano left. That was good, because we both figured at some point one of us wouldn’t be needed. So how do you survive 20 years in this business? It sure isn’t because I’m beautiful! Part is luck, part is timing, being in the right position at the right time. Part might be making sure you’re not so highly paid you’re a target to dump when times get tough…I’m not sure. 1. Be FLEXIBLE. Don’t let yourself get steamrolled, but choose your battles carefully! Remember, it’s not brain-surgery, it’s television. Is it really worth ruining a career just because you don’t want to put labels on the high temp map??? Just an example. 2. Treat others well. Don’t make enemies for absolutely no reason. If you’re cranky or unhappy, no need to drag everyone else into it. 3. Be willing to learn and adapt. I’m pretty sure I would have been dumped at one specific point if I wouldn’t have simplified my presentation a bit. That doesn’t mean dumb it down, but be willing to give a little. 4. Don’t burn bridges! It’s tempting to do that if you leave a job, but don’t. Someone who produced weekend newscasts at KOIN ended up being my current boss! Glad I didn’t act like a jerk back then. The big question…do I still like my job and how long will I keep doing it? Yes, most of the time I like my job. I’m getting tired of the late night shift (to bed at 1am). I am a morning person so I have trouble sleeping past 8 nowadays. But I’ve had a lot of fun and it’s paid the bills. Plus I get paid to do my hobby…what’s better than that? I have no idea how much longer I’ll be doing this; but there are no plans on my end to change anything. East wind is finally really starting to ramp up now in the Columbia River Gorge. It’s been relatively light the past day or so. But now temperatures are starting to warm up overhead, while the cold pool east of the Cascades at the lower elevations isn’t going anywhere through early next week. Thus a classic setup for a strong “gap” wind event. That means air moves through a gap in topography. In this case the Columbia River Gorge. East wind is here until further notice at the west end of the Gorge, at least through early next week. Gusts 70-75 mph in Corbett and Cape Horn areas. Saturday looks like an excellent day to experience the high winds at Vista House! Although Friday and Sunday will work too. Classic thick dome of cold air extending all the way up to 4,000′ into Central Oregon. At the same time 850mb temps rise dramatically westside. They end up around +11 west of the Cascades and probably +2 eastside. That’s quite a difference. When you get such warm air overhead westside, it really squeezes the easterly windflow into a narrow channel down below = very windy! Notice the 45 kt. wind the next 48 hours over Troutdale. Impressive, a typical strong wintertime event. It never shows above 50kts (that I’ve seen) We probably see this 5 times a winter, like we see 95-110 mph wind on those steps several times each winter; often when no one is there (in the middle of the night). Tomorrow and Saturday are definitely worthy of your time out there if you have the day off and have never experienced the east wind. A side note; the Corbett wind sensor that has operated flawlessly for 3 years died THIS MORNING. Of course that couldn’t have happened in June, July, August, or September… so if Vista House sensor dies, there won’t be any strong wind reports from that part of the Gorge available online. Just noticed the dewpoint is down to 8 at PDX…wow. It’s rare to see it that low. I did a quick plot back to November 2011 and I see we haven’t been below 10 since that time. You are currently browsing the FOX 12 Weather Blog blog archives for November, 2013.